(Video on Demand, June 2015) I usually try to write my capsule reviews without references to whatever elusive “critical consensus” exists about a film. With Jupiter Ascending, though, it’s difficult to avoid noticing that the film has earned a surprising number of scathing reviews. I think I understand why, but even that understanding can’t take away my annoyance at what I’m seeing as an unfair critical drubbing. 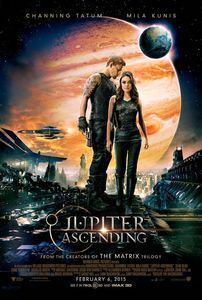 To put it simply: Jupiter Ascending is a big quirky space opera and that’s such a specialized sub-genre that I’m not surprised that a lot of people would simply bounce off of it. 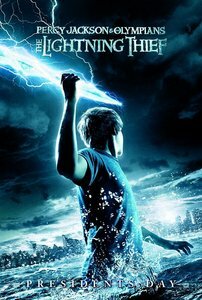 Not that I’m overly pleased with an umpteenth “chosen one” rags-to-riches story –even less so from the Wachowskis, who pretty much did that storyline to quasi-perfection in The Matrix. Also not terribly cool: how wanton destruction is waved away, the caricatured characters, the brain-dead way a supposedly advanced alien society behaves, and other assorted shortcuts from reality. (The mad-bureaucracy sequence also feels out-of-place with the rest of the film, but seeing Brazil’s Terry Gilliam at the middle of it is almost an acceptable excuse) Strangely, it’s the weird wackiness of Jupiter Ascending that’s the best thing about it: bees domesticated by the queen of the universe, real-estate deals powering the entire plot; a dog-hybrid warrior with a gun that goes “woof!”; immortals back-stabbing each other for profit. That’s pure far-future Science Fiction stuff, too rarely seen on the big screen. If nothing else, I have a soft spot for such flights of fancy. Here, the Chicago nighttime action sequence works pretty well (although I feel that it’s been over-edited, runs too long and is almost instantly trivialized come morning), and the visuals once the action moves to space are nothing short of spectacular: The Wachowksis may have trouble with plot, but their eye for spectacle remains just as effective. Mila Kunis and Channing Tatum are unspectacular in the lead roles, but Sean Bean gets a nice turn as a character who (spoilers!) survives until the end of the film, and Eddie Redmayne gets a chance to ham it up as a spoiled aristocrat. While Jupiter Ascending has significant holes and annoyances, it’s also a film with the advantage of its eccentricities. I’d like to see more movies like that take chances and fall flat on their face rather that play it safe like most blockbusters today. (On Cable TV, August 2013) I’m not sure anyone was asking for a Silent Hill sequel, but there it is. And there’s just about no reason to watch it. 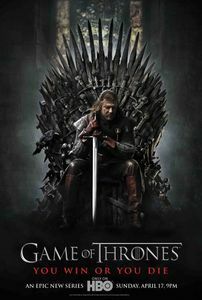 The plot is instantly forgettable, the mythology is borderline-incomprehensible, the scares are decidedly ordinary and the actors are merely serviceable (although it’s fun to see Sean Bean alongside Kit Harington playing a teenager outside Game of Thrones, and Adelaide Clemens really does look a lot like Michelle Williams). 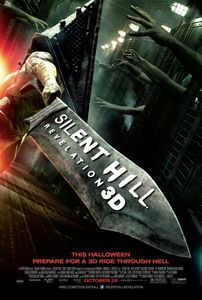 What Silent Hill: Revelation does have going for it are occasionally moments of oppressive atmosphere in the tradition of the first film. They are farther apart that could be expected, though, as about half the horror set-pieces end up feeling contrived, badly adapted from other superior films or simply more grotesque than chilling. Otherwise, that’s pretty much it. Sharp-eyed viewers will easily spot that the film was shot in Canada (the bilingual notices on the school-bus being a dead giveaway) but that’s really not enough to warrant a look for such a dull film. (On Cable TV, February 2013) There is a curious tension at work during Cleanskin, a British thriller opposing ideological terrorists and the special operatives chasing them down. While the film may indulge in a series of excessively violent episodes in which covert operatives are cleared kill terrorists by any means necessary, it’s also willing to allow itself a lengthy series of flashbacks to explain how a politically-motivated student can take up terrorism as a cause. At times, Cleanskin shows terrible mistakes by government agents before taking a late-film turn into conspiracy theories. Does this mean that the film is complex, or merely incoherent? There’s no right answer if viewers are willing to view the film solely as a genre exercise, where “might makes right” isn’t incompatible with vaguely leftish good sentiments. What’s more certain is that Sean Bean turns in an efficient performance as an Afghanistan veteran pressed into service as a ruthless killer; the film gets weaker the longer it spends away from him, such as in the interminable flashback scenes explaining the life history of the lead terrorist. (The other noteworthy performance in the film belongs to Silas Carson, who brings bone-chilling menace to a relatively minor role.) It does seem, at time, that Cleanskin is trying to be a mean-and-lean action thriller with shoot-‘em-down villains even as it tries to bring ambiguity and complexity in a more dramatic framework. It doesn’t entirely work if only for pacing reasons: Just as the film seems to accelerate on a thriller level, it stops dead for half an hour of dramatic background that doesn’t do much but muddy the waters. While there is a lot to admire in the final result, there is also a bit too much in the final mix. For a film that is so good at being without frills, the added fat just takes away from what could have been a truly better thriller.